Wave 11 article is up! Reinforce action makes you choose front/back. Wookiee ship has a 180 arc. And punishers/bombers are... good now? 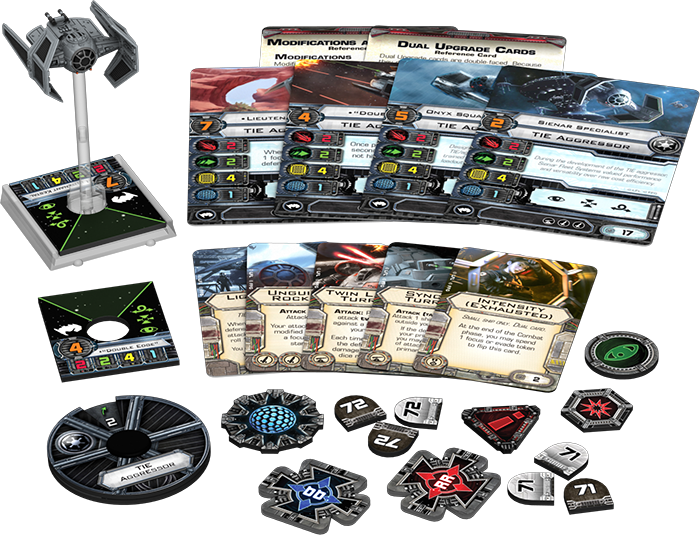 Well FFG's sculptors have done it again. That Gunship looks ugly as sin in pictures but that's actually quite a pretty little model. The Aggressor kind of proves that some things are beyond saving, mind. What do we think of the new 'unguided rockets' upgrade? Seems like a dud to me - why would you want them other than to shoot a range 3 shot with no range bonus for them? Because it's unlimited rockets to help increase the damage of bombers and the like. There is no discard this card in that line of text. The Aggressor's only got 2 attack dice. So it's an extra die and no range bonus. Re Unguided Rockets - Notice it doesn't say you have to discard the card? No discard. Huge buff to bombers, punishers and the new tie. 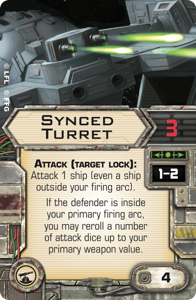 I really like that Synced Turret as a followup to what they've done with Rey and Dengar - Turreted ships should still have to care about where they are on the board. I don't know how good it will be, but my first thought is to use it with BTL-A4 Y-Wings so that both shots can be modified easily. I think this confirms it. They made the TIE Punisher and the TIE Agressor. They are only making TIE fighters for the Empire. There will never be Assault Gunboat or Missile Boat. Wookie Ship: Does that thing have a 180 firing arc or are they just using the same exact line pattern to divide the halves of the ship for Reinforce? 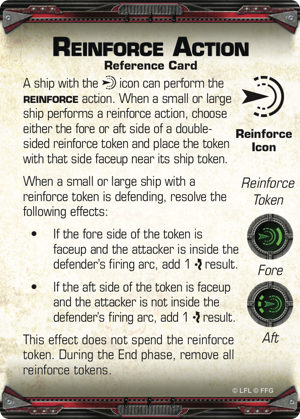 It mentions " Or if you reinforce your Auzituck's aft, you gain an extra evade result against any attack made by an enemy outside your firing arc. " which makes me believe thats a 180 firing arc. HELL YEAH! Also...everyone was wondering what the Rebel "----lessness" card would be? there it is, "Selflessness" and its unique for some reason. No idea what it does but thats pretty clear what its called lol. 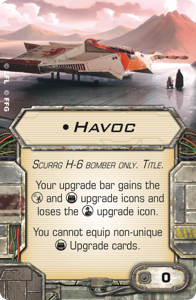 Scurgg: stats alone make me want this ship and make me fear for its dial. 10hp for 24pts at the PS1 level? And it looks like the only rebel pilot is Nym, which is...odd...even if it is thematic. Not sure if i care about the Salvaged Astromech slot since its denied nonunique mechs yet, gotta see what that R4 unit does. TIE Aggressor: Cheap TLT user for the Imps! Hazaa! Also double missiles? odd combination. Though it does have a double missile card you dont discard. 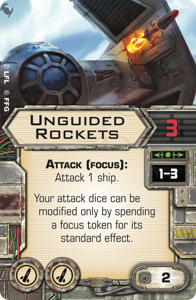 I dont fully understand the wording on that card though, it sounds like they should have said "You may only mod your dice with focus tokens" to me. Also the new turret is interesting though im not sure who i'd want that on. Wookie ship is clearly the winner so far. Things change as we see dials and more cards though. Srsly. I really like the design of that. I think they might have hit the nail on the head for 'range 1-2 3-attack turret' here. Looks like Cruise Missiles are proton rockets but the damage is based on the speed of your move that turn. Now that I realize that unguided rockets are not dicarded, I find them suddenly far more interesting. If they said ou could only mod with focus tokens you could e.g. mod with calculation or mod with Weapons Guidance, which they evidently want to avoid. Besides the "no discard" that it mentions, this could free up 2 pts from EM if you just want to build a rocket boat. It could bring low PS bombers back into play as you don't need to worry about locks to be able to fire out to range 3 with no range defense bonus. It's not bad for a budget build. You can't use Chimps with them, but that does free up the slot for LWF to bring up your survivability, since LRS will not be needed either. My initial impression is that it is a good card for budget builds. One of the problems with ordinance ships was that they go too expensive too fast. If you run bombs on a Bomber or Punisher, you still can grab EM with a torp slot to get more bombs as needed. Redline is going to scoff at this though, just keep Homing Missles on him. 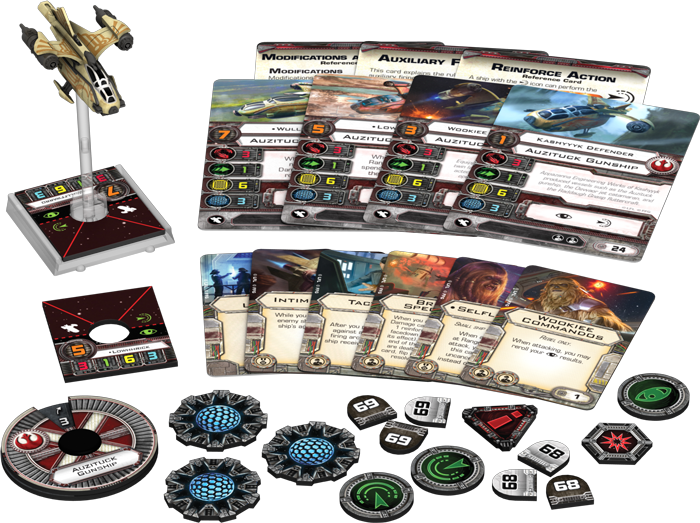 Hm, that Rocket card looks interesting on Thomax Bren, but not on many other ships to be honest. Maybe 18 point Scimitars prove me wrong, though! Unguided rockets seemed kinda meh until I noticed you don't discard them to fire. Interesting upgrade, 2 points and two missile slots for what's basically a 3 die range 1-3 cannon secondary weapon. That restriction that you can only modify its dice with a focus token though is a little meh. Synced Turret BTL-A4 Y-wings seem like they should be pretty nasty as they'll be able to get mods on both shots now. Unhinged on Scum and R2s on Rebels, not bad. I'm really curious what Intensity's other side does given the cost to flip it back over. That said none of the actual ships hold any interest for me personally. Second wave in a row I'll be buying just for the cards. No fix for the X-Wing. It's worded like that because you can do other things with focus tokens. The first one that comes to mind is weapons guidance. Weapons Guidance doesn't work with unguided rockets. Some of these upgrades look so amazing. I'm definitely looking forward to seeing what a synced turret on the Ghost can do. I also really want to see the text of cruise missiles and that crew card that mentions reinforce (maybe after taking damage?). What card are you reading? 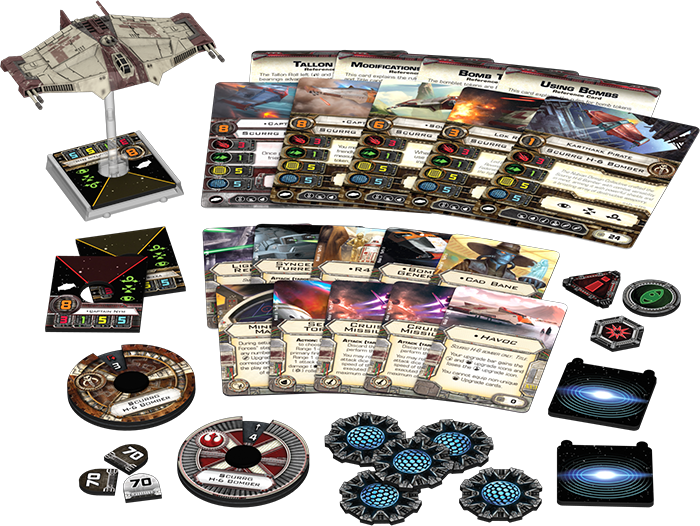 "Your attack dice may only be modified by spending a focus token for its standard effect" means no target lock, no predator, no emperor, no sensor jammer, nothing but spending a focus to turn eyeballs to hits.